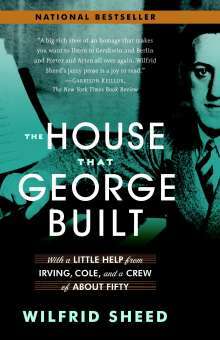 Der Artikel Wilfrid Sheed: The House That George Built: With a Little Help from Irving, Cole, and a Crew of about Fifty wurde in den Warenkorb gelegt. Ihr Warenkorb enthält nun 1 Artikel im Wert von EUR 20,95. It began when immigrants in New York's Lower East Side heard black jazz and blues-and it surged into an artistic torrent nothing short of miraculous. Broke but eager, Izzy Baline transformed himself into Irving Berlin, married an heiress, and embarked on a string of hits from "Always” to "Cheek to Cheek.” Berlin's spiritual godson George Gershwin, in his brief but incandescent career, straddled Tin Pan Alley and Carnegie Hall, charming everyone in his orbit. Possessed of a world-class ego, Gershwin was also generous, exciting, and utterly original. Half a century later, Gershwin love songs like "Someone to Watch Over Me,” "The Man I Love,” and "Love Is Here to Stay” are as tender and moving as ever. Sheed also illuminates the unique gifts of the great jazz songsters Hoagy Carmichael and Duke Ellington, conjuring up the circumstances of their creativity and bringing back the thrill of what it was like to hear "Georgia on My Mind” or "Mood Indigo” for the first time. The Golden Age of song sparked creative breakthroughs in both Broadway musicals and splashy Hollywood extravaganzas. Sheed vividly recounts how Cole Porter, Richard Rodgers, Jerome Kern, and Johnny Mercer spread the melodic wealth to stage and screen. Popular music was, writes Sheed, "far and away our greatest contribution to the world's art supply in the so-called American Century.” Sheed hung out with some of the great artists while they were still writing-and better than anyone, he knows great music, its shimmer, bite, and exuberance. Sparkling with wit, insight, and the grace notes of wonderful songs, The House That George Built is a heartfelt, intensely personal portrait of an unforgettable era.